The World Business Council for Sustainable Development (WBCSD) together with the Cement Sustainability Initiative (CSI) are member-based organizations galvanizing the global business community to create a more sustainable future for business, society and the environment. WBCSD was founded in 1992 to ensure businesses had a voice at the Rio Earth Summit. Since then, WBCSD has grown to 200 members companies drawn from more than 35 countries and 20 major industrial sectors, involving more than 1,000 business leaders globally. Through its members, both the WBCSD and CSI apply thought leadership and advocacy to generate constructive solutions and take shared action to drive business action on sustainability, including road safety initiatives. In partnership with other organizations working to improve road safety, WBCSD is delivering the Sustainable Mobility Project in six cities around the world to improve road safety, congestion and delay, travel time, inter-model connectivity, public spaces, access to mobility services and greater access for people with restricted mobility. 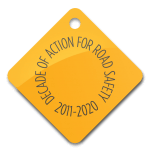 CSI have partnered with the Global Road Safety Partnership to host a multi-sectoral roundtable on road safety in India, bringing together actors from the private sector, civil societies and governments, focusing particularly on reducing road crash injury and death. The Sustainable Mobility Project (SMP) is scaling up: we are developing partnerships to help cities worldwide use the SMP2.0 methodology and tools as they develop sustainable urban mobility plans. SMP has been successful in six demonstrator cities and the quality of the SMP tools is being widely recognized as shown by the endorsement of the European Commission and its nomination to be a Transport Quickwin* at COP22. Contact us if you are interested in implementing sustainable mobility in your city!